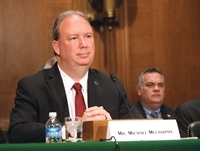 APTA President & CEO Michael Melaniphy testified April 23 before the Senate Banking, Housing, and Urban Affairs Committee about the importance of public transportation investment to American jobs and global competitiveness. He cited the $86 billion backlog in state of good repair capital investment needs industry-wide and stressed the need to pass a long-term bill with increased funding for program growth. Melaniphy urged the committee to pass a six-year, $100 billion transit title to the next surface transportation authorization bill that would grow the transit program from $10.7 billion to $22 billion by 2021. Committee Chairman Richard Shelby (R-AL) reiterated his belief in a fiscally responsible funding method that could provide certainty and stability to the transportation system. Ranking Member Sherrod Brown (D-OH) stressed the issues with the current backlog of repairs that DOT has cited, highlighting the instability created by flat-funding and short-term patches that have been used in the past. Video of Melaniphy’s testimony is available here. The full hearing and prepared remarks offered by the witnesses, as well as the remarks by Shelby and Brown, are available here. FTA Acting Administrator Therese McMillan testified before the same committee on April 21, reporting on the upcoming expiration of MAP-21 and the Obama administration's GROW AMERICA Act proposal. Shelby indicated support for a long-term bill while emphasizing the funding challenge that faces Congress; he also noted the importance of finding more ways to leverage private sector investments. Brown spoke of the need to pass a long-term bill and invest more, given the increasing demand for public transportation and the extensive state of good repair backlog. To view the hearing in its entirety or to read McMillan’s prepared remarks, click here. On April 22, DOT Secretary Anthony Foxx testified before the Senate Appropriations Subcommittee on Transportation, Housing and Urban Development and Related Agencies Appropriations Subcommittee regarding its proposed Fiscal Year 2016 budget. Chairwoman Susan Collins (R-ME) called the proposed budget bold but said it does not deal with some of the larger reforms necessary for Highway Trust Fund solvency. Ranking Member Jack Reed (D-RI) noted maintenance issues surrounding the current U.S. transportation system and underlined the importance of investment in infrastructure for the nation. To view the hearing in its entirety or to read Foxx’s prepared remarks, click here. DOT Secretary Anthony Foxx announced a new technical assistance program, “LadderSTEP,” that will help seven cities foster sustainable economic development related to planned transportation projects. In his announcement April 23, Foxx explained that the pilot program will provide technical assistance for planning and economic growth in Atlanta, Baltimore, Baton Rouge, LA, Charlotte, NC, Indianapolis, Phoenix and Richmond, VA. LadderSTEP is part of DOT’s Ladders of Opportunity program. Learn more here. Early registration for the APTA Rail Conference closes May 5, so make plans now to attend! This year's conference, June 21-24 in Salt Lake City, will offer six tracks of educational sessions: technology and technical forums, operations and maintenance, safety, security and emergency preparedness, planning, finance and sustainability, capital programs and workforce development, management and policy. Chicago RTA turns Earth Day into Earth Week by featuring events that focus on the regional service’s value to commuters and the environment. Read more here. Anything but “boring:” Crowds turn out at 2 a.m. to see a pair of 400-ton boring machines transported through Toronto’s streets. Metrolinx provided bleachers, hot chocolate and coffee. See details here. There’s (almost) an app for that: Apple is making progress on adding public transit to its mapping function—one of its “most anticipated features.” Read all about it here.